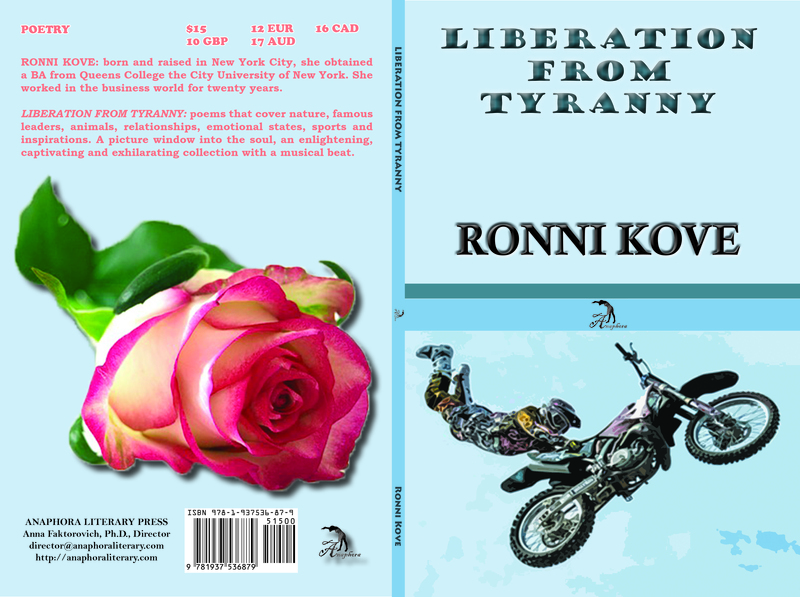 Liberation from Tyranny: ($15, ISBN: 978-1-937536-87-9, Hardcover ISBN: 978-1-68114-128-2, LCCN: 2014951079, 6X9”, 84pp, September 2014, Buy on Amazon or Barnes and Noble): is a collection of poems that covers nature, famous leaders, animals, relationships, emotional states, sports and inspirations. It paints a picture window into the soul. An enlightening, captivating and exhilarating collection with a musical beat. Ronni Kove: born and raised in New York City, she obtained a BA from Queens College the City University of New York. She worked in the business world for twenty years.